Rice is our staple food and we prepare plain rice almost every day for our lunch. We have so many options for dry curries/ side dish like Thoran, Mezhukkupuratti, Erissery, Pulissery. But for pouring curries/ ozhichu curries we always prepare sambar, dhal, rasam, moru curry. But we have more healthier and tastier options too for pouring curries. 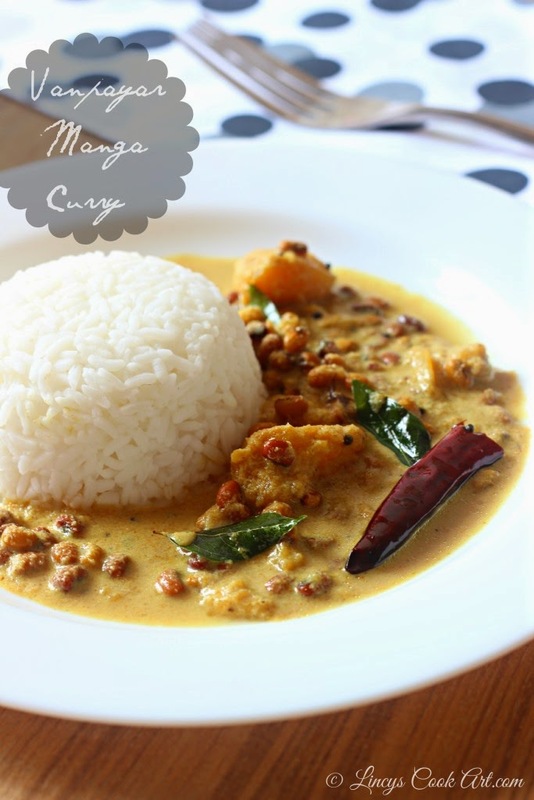 This yummy curry is an easy to prepare curry can be prepared within minutes. I am sure you are really going to love this curry. Slightly tangy and mildly spicy; perfect balance of taste and flavours. Try this curry at home and let me know the results. Soak the cowpeas over night or minimum 5-6 hours in water. Cut the mangoes in to big chunks. Pressure cook the cow peas and cut mangoes with salt, turmeric powder and one and half a cup of water till the cow peas get cooked. It should not become mushy, cook around three whistles over medium heat. Once the pressure releases from pressure cooker open the lid and turn on the heat, add chilli powder and coriander powder and mix well. Grind coconut, pearl onion and peppercorns together as a fine paste. Once the vanpayar curry starts to boil add this coconut mixture and mix well. Heat oil in a pan and add mustard seeds and chopped pearl onion once the mustard seeds starts to splutter add thedried broken red chilli and curry leaves allow to fry for a second and switch off the gas. When the curry starts to bubble add the sugar and tempering; mix well and switch of the gas. Perfect for light lunch, love the dish. Lovely pics.. curry looks delicious.. Very flavourful and delicious curry..